Brian Donlevy plays a man who makes the classic mistake of running away with a gangster’s girlfriend. The couple ends up in Havana, but their honeymoon is interrupted when the gal takes a knife in her back. Donlevy ends up on the run from the cops when he’s framed for the crime. It’s the sort of role that Donlevy was good at and he runs into a fun supporting character in the form of a fiery widow known as Midnight. The worst thing about time travel is the lack of deodorant. Science fiction writer L. Sprague de Camp was a smart guy. It shows in his prose. He never came across as pretentious--in fact, his prose is witty and highly readable--but his wide vocabulary and knowledge on myriad subjects keeps his intelligence fully on display for his readers. 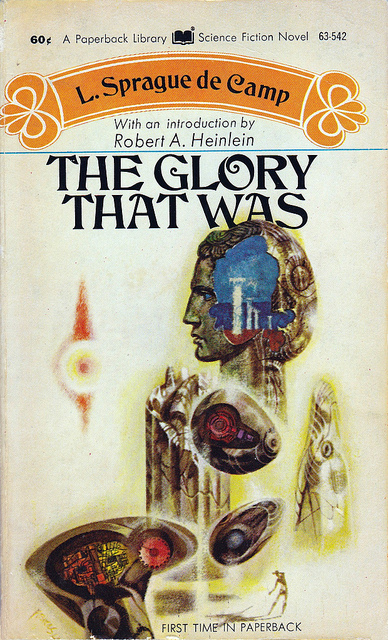 Heck, I consider myself a fairly well-read guy with a pretty decent vocabulary, but when I just re-read The Glory That Was (1952), I was using the auto-dictionary function on my Kindle an awful lot. de Camp even describes an island has having "the shape of the Hebrew letter vav reversed" and apparently assumes that his readers will just nod wisely and think "Okay, I got that." But, as I said, he never comes across as pretentious. 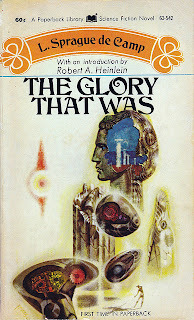 The Glory That Was is an unusual and very entertaining science fiction yarn, full of gentle humor without ever turning into a parody or satire. It's set in the 27th Century. There's an Emperor of the World, but he's more a figurehead than a political leader. Still, he has enough pull to arrange to have Greece surrounded by an impenetrable force field. When people of Greek descent begin to vanish, two-fisted journalist Knut Bulnes decides to investigate. With him is portly classical scholar Wiyem Flin, whose wife is among the missing. The two figure out a way to bypass the force field in Bulnes' yacht, but the boat is then rammed and sunk by what appears to be an ancient Greek trireme. Getting ashore, the two men find themselves in what is apparently Greece in the time of Perikles, just before the Peloponesian War breaks out. But have they gone back in time, or is it all an elaborate hoax? Much of the story depends on Bulnes and Flin figuring out a way to answer this question. de Camp takes the bizarre premise and moves the story along logically within that framework, building up a nice level of suspense and inserting a couple of well-described action scenes. But the best part of the novel is the fun de Camp has showing us how the two 27th Century guys deal with being in the pre-industrial past. Flin, for instance, is fascinated by the prospect of being in Periklean Athens, but he soon gets sick of having to walk everywhere--of the lousy food and bad wine--of the lack of being able to get a cup of tea--of the bed bugs and the absence of personal hygiene. de Camp also has some fun presenting Sokrates and other philosophers as delightfully flawed human beings. The humor is never mean-spirited--it simply plays off the foibles of human nature. That was one of de Camp's strong points and it's why his books and short stories are always so much fun to read. This wonderful storyline wraps up with a great fight scene between Ben and Torgo—as well as the bonus of getting to see Crystal looking cute as a button in 1920s flapper garb. Ben is fighting in the Arena against Torgo, but when he gets the upper hand, he refuses to kill his opponent. When this allows Torgo to get the upper hand, the robot now can’t bring himself to deliver the coup de grace either. 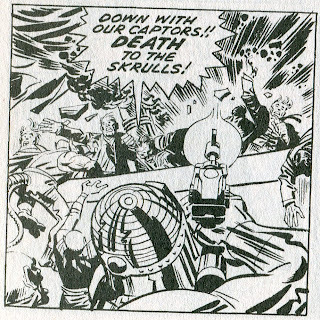 Fortunately, the rest of the Fantastic Four has followed the Skrull slaver’s energy trail to this planet. 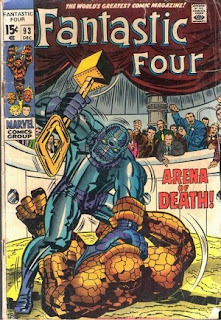 Crystal generates a shock wave that destroys the Skrull’s planet-busting weapon (something, we learn, that is an irreplaceable one-of-a-kind device). Torgo, no longer fearing for the safety of his home planet and inspired by Ben’s courage, immediately launches a slave rebellion. The FF make a getaway in the confusion. This short summery doesn’t do justice to the marvelous visuals, the exhilarating battle scenes and the spot-on character moments. I’ve always been a fan of this story arc, but it is only while re-reading it with the intention of reviewing it that I realize just how good it is. 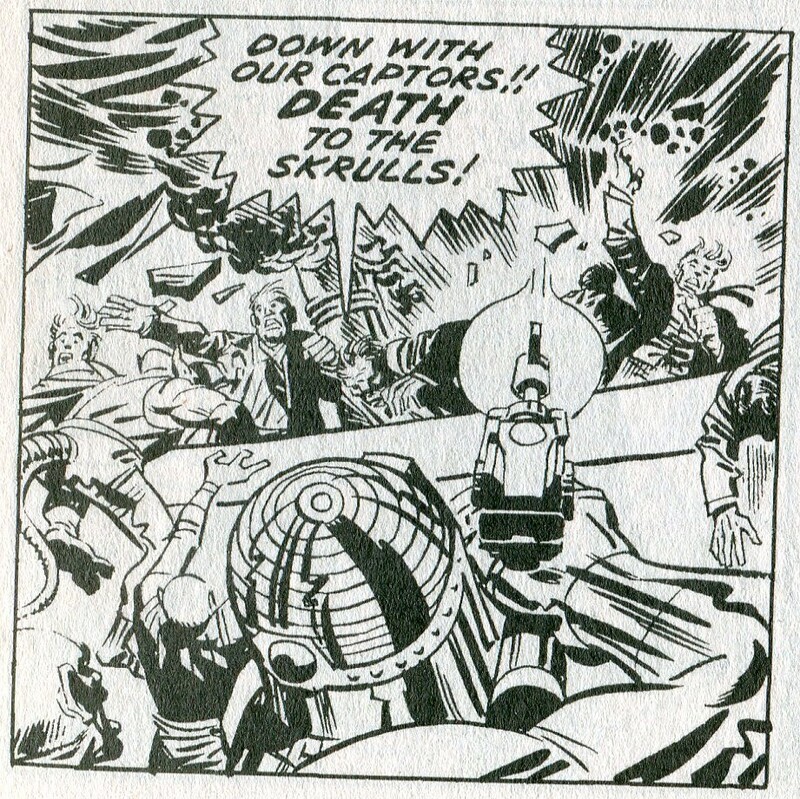 As I’ve mentioned in my remarks on previous issues, the combination of gangster imagery with science fiction gadgetry and a plethora of aliens fighting in the arena leaves this entire story arc dripping with a level of imagination so pure that--if you could harness imagination in a generator--you could power the entire Eastern Seaboard with it. I do have to wonder why the FF didn’t stick around to help the rebelling slaves/gladiators. But Torgo seemed to have things well in hand, so I won’t complain. 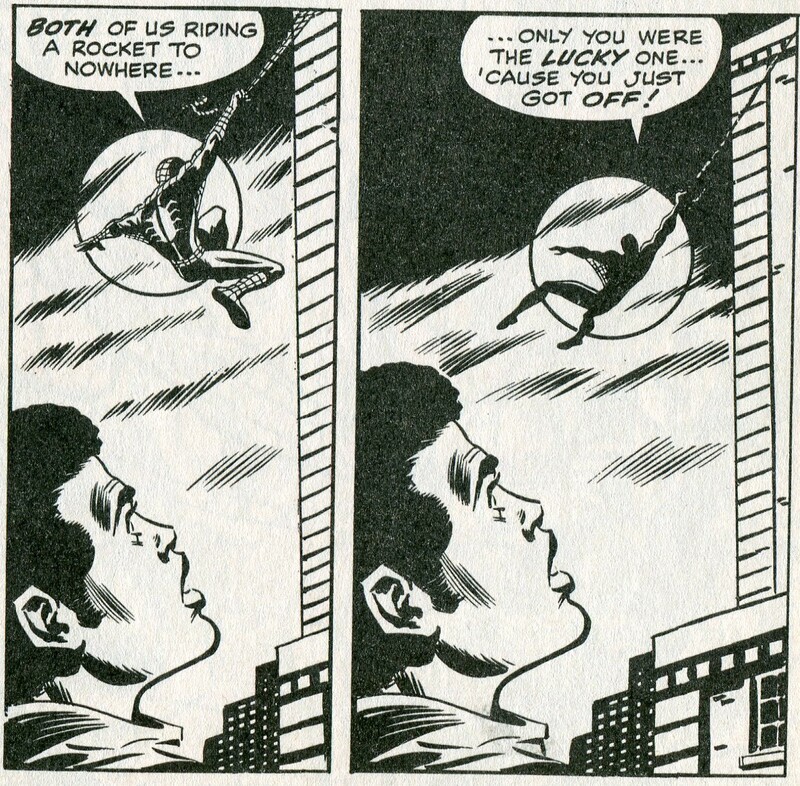 Confronted by the Prowler in the Daily Planet building, Peter pretends to stumble back in panic and fall out a window (later claiming that Spider Man saved him.) 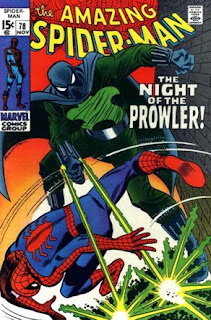 He and the Prowler fight, but through a fluke, the inexperienced bad guy gets away. Peter has time to tell Gwen off for supposedly seeing Flash Thompson on the side, then goes out after the Prowler again. By now, poor Hobie Brown is racked with guilt because he believes he’s responsible for someone’s death and realizing he’s outclassed by Spider Man. It’s a nice story, giving us another minor but fun part-time superhero who will pop up again from time to time throughout the years. 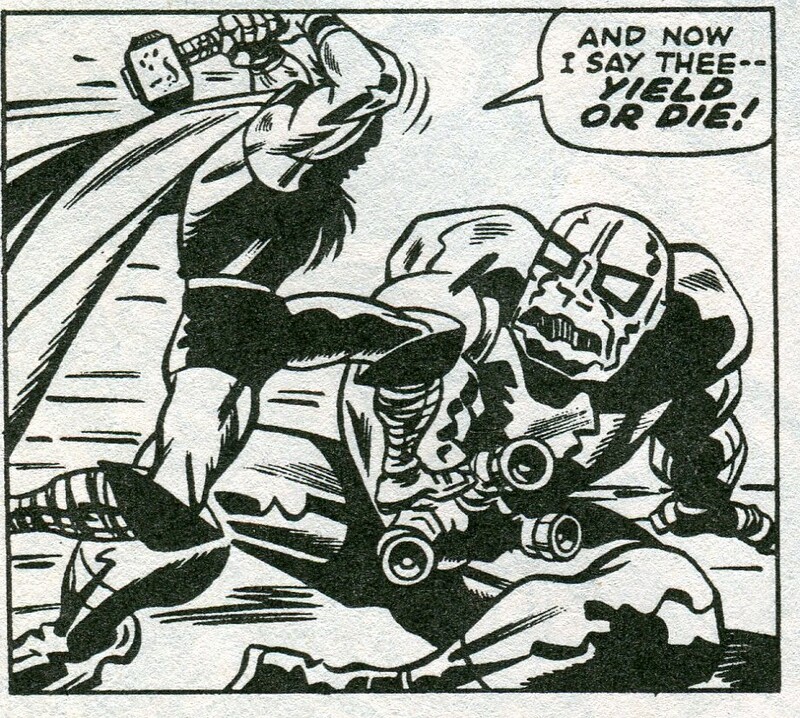 We are, sadly, nearing the end of Jack Kirby’s run on Thor. This issue is the first of four successive single-issue stories. Then we’ll get a three-issue “Fall of Asgard” story arc. Then Sal Buscema fills in for one issue, followed by Jack doing the first part of a story involving Loki switching bodies with Thor. After that, Jack is gone—soon to be creating New Gods and post-apocalyptic worlds for DC comics. But he’ll be going out with a bang. This issue has Donald Blake performing a tricky operation that only he has the skill to do. But he’s interrupted when the Wrecker escapes from custody and goes on a rampage. Blake has to take a chance on leaving his patient for awhile while dealing with the Asgardian-powered thug. 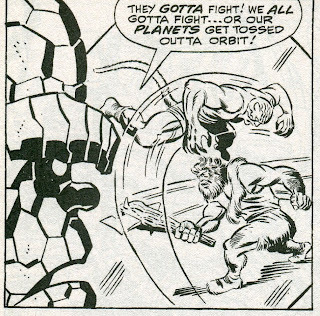 It’s not an important issue in terms of character development or plot—but it’s a typically awesome example of how good Kirby was at choreographing fight scenes. 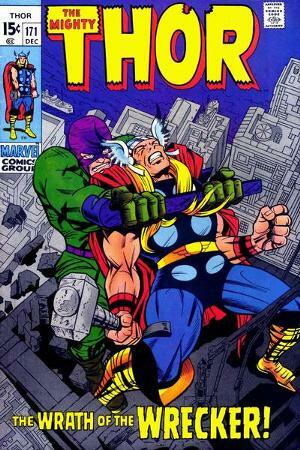 Thor and the Wrecker fight on the rooftops, in the streets and finally in the subways, where the Thunder God tosses the villain onto the third rail, then adds the power of his hammer to the electric shock to drain away the Wrecker’s power. And it all looks breathtaking. Jack may have been unhappy with the way Marvel was treating him by this point, but he was a real pro who never let this effect the quality of his work. That won’t last, of course. 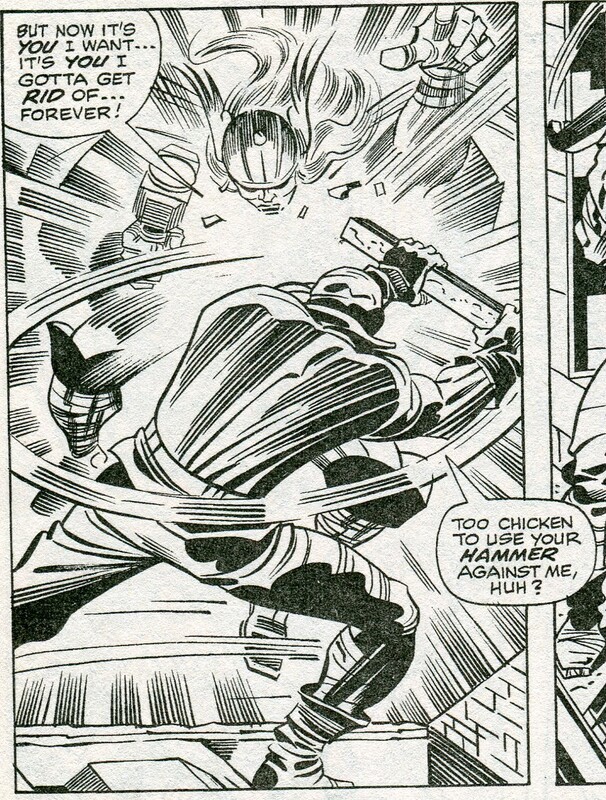 A bad guy with a cosmically powered crowbar is simply too cool an idea to let lie. Eventually (I think in an issue of the Defenders) he’ll escape from prison and recover his crowbar, which will not only re-power him, but give three other escapees similar powers. Thus we’ll have the Wrecking Crew. But for now, the fight is over. Thor reverts to being Dr. Blake and returns to the operating room, saving his patient. Which brings us to the end of 1969. When Baby New Year brings the year 1970 to us, the Fantastic Four will be fighting some old enemies; Spider Man will be fighting an old enemy; and Thor will be running into an old girlfriend. 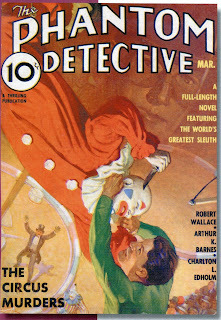 This fun and very dynamic cover is by Norman Saunders, whose career in the pulps and in comics was long and honorable. In 1962, he was also responsible for the famous Mars Attacks trading cards. My latest ebook is titled The Character of God and the Route to Salvation. It's subject matter is different than what I usually write about on this blog and in my other books. But, when it comes right down to it, eternal salvation probably is a tad more important than B-movies and comic books. Though it is, admittedly, a pretty close call. This is a typically solid police procedural. The most fun thing about it is Harry Morgan (who would one day play Jack Webb’s partner on the TV version of Dragnet) guest-stars as a suspected jewel thief with a snotty attitude. Sharp-eared OTR fans will also recognize Raymond Burr as the chief of detectives. I've been self-publishing ebooks for the Kindle for some time now. I've finally gotten around to making several of them available for the Nook. 99 Films and Cartoons Your Children MUST See Before Growing Up: OR THEY'LL TURN OUT TO BE AXE MURDERERS! A year or so ago, I wrote about a particularly strong story arc from Our Army at War, featuring Sgt. Rock. The DC war-themed books of the time didn’t usually do extended story lines or multi-part stories. But when Archie Goodwin became editor in the early 1970s, Sgt. 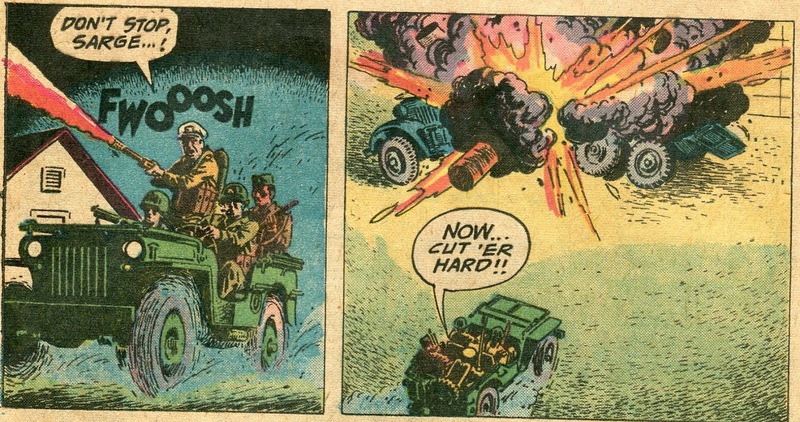 Rock, the Haunted Tank and the Losers all suddenly became involved in long, multi-issue adventures. I assume this was Goodwin’s decision as editor. If so, then it was an excellent decision. I’ve talked in that previous post about how good the Sgt. Rock story was. Goodwin himself wrote the concurrent Haunted Tank story arc—something I’ll get around to discussing eventually. 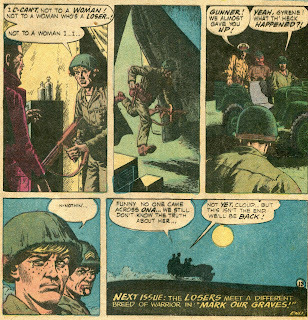 Bob Kanigher, who was writing Sgt. Rock, was also writing Our Fighting Forces—featuring the ad hoc commando group known at the Losers. The Losers had an odd origin. 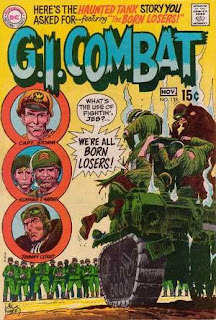 Each of its members—PT boat skipper Captain Storm; fighter pilot Johnnie Cloud; Marine grunts Gunner and Sarge—had each had their own solo series during the 1960s. 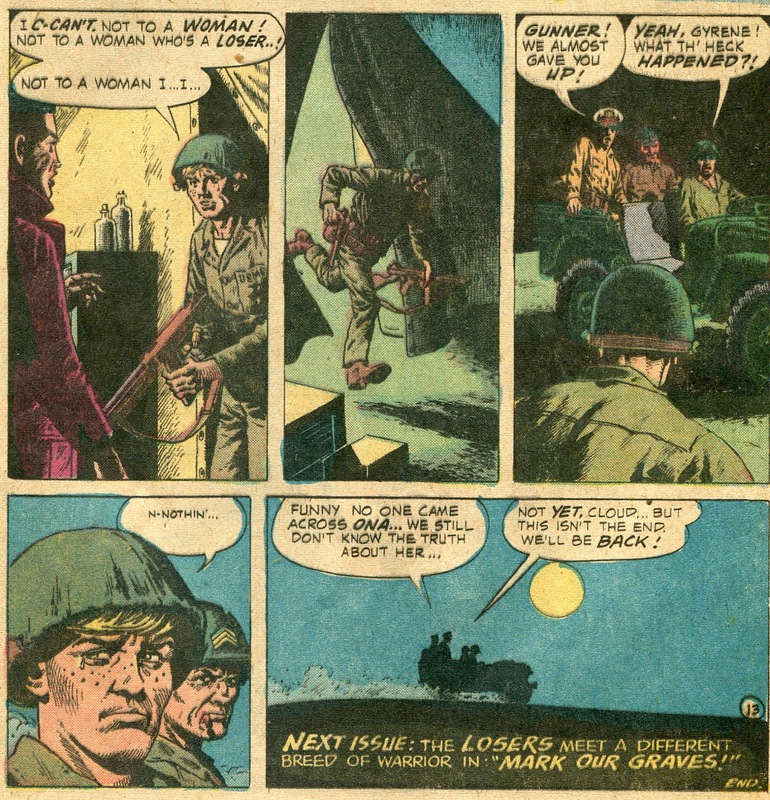 When those various series came to an end, Kanigher used an issue of G.I. Combat and a team-up with the Haunted Tank to bring them together as a unit. 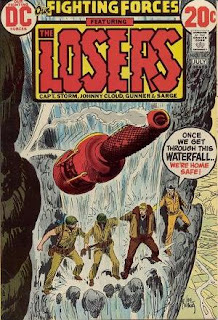 The theme behind the Losers was that they were assigned the most difficult and dangerous missions—and that they never completely come out on top. Often, those who are helping them get killed or the mission turns out to be unnecessary. Sometimes, this would come across as a little contrived. But the stronger stories often carried a sharp emotional impact. In Our Fighting Forces #132, John Severin became the regular artist on the series and stuck around for 19 issues--a run that represents the best of the series. It was during this time that Goodwin became editor and long story arcs became the norm. For the Losers, this meant that Captain Storm was presumed killed during a mission in Norway, though it later turned out he had amnesia and had become a pirate. (It’s not as silly as it sounds when you read the actual story.) During this time, a young woman from the Norwegian underground joined up with the Losers. This was Ona, a very pretty and brave young lady had the willingness and determination to stick a dagger into an SS officer should the situation call for it. It’s no wonder that Gunner soon falls in love with her. After Storm regained his memory and rejoined the group, the Losers are sent to Africa to recover a cache of industrial diamonds before the Germans get to them. Things go somewhat awry—as they always did for the Losers—and they end up wandering through the Sahara, getting involved in a series of mini-adventures. They ally themselves with a French Legionnaire, a not-quite-sane British officer and some vengeful Bedouins. During this time, Gunner’s feelings for Ona trump his experience as a soldier and he nearly gets everyone killed by trying to protect her. Feeling this makes her a burden to the group, Ona strikes out on her own during a sandstorm. The next time the Losers see her, she’s making nice with a German officer. Has she turned traitor? No, she hasn’t. In a situation that is probably a little over-the-top in terms of melodrama, Ona has met a German officer she dated before the war. She’s making nice to him because a prisoner in the camp he commands is a Norwegian that Ona has once been engaged to. The Norwegian is wounded and blind, but Ona won’t abandon him. Of course, the Losers know nothing of this and can’t help but suspect Ona has turned traitor. But when Gunner confronts her during a raid on the German camp, he can’t bring himself to pull the trigger. Despite the melodrama, the story works. Severin’s excellent art linked with Kanigher’s storytelling skills (which always improved when he had an exceptional artist to work with) ties this all together and gives both the individual mini-adventures and the overall story arc both excitement and emotional impact. But by then, Archie Goodwin had moved on. Starting in issue #151, Jack Kirby took over as writer and artist for the Losers. If I remember correctly, he was assigned the book by DC and was reluctant to write for someone else’s characters. In fact, he wasn’t familiar with the characters at all. 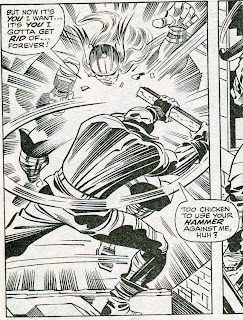 Someone (I can’t remember who—perhaps Mark Evanier) has pointed out that there’s nothing in Kirby’s run that indicates he knew Captain Storm had a wooden leg. And, if he was going to have to work with these characters, he’d do it his way. Kirby tossed aside the current continuity and took the book in his own Ona-less direction. Suddenly, the Losers were out of the desert, carrying out missions in Europe and the Pacific. It was as if Ona never existed. 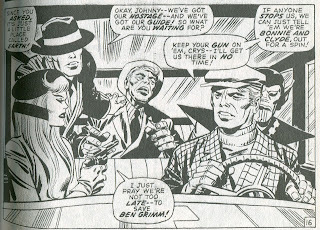 Kirby’s run on the Losers is a strong one—Jack Kirby was probably incapable of doing anything other than quality work. 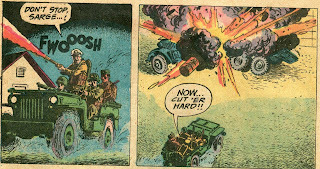 (Our Fighting Forces #152 is a particularly engrossing story.) 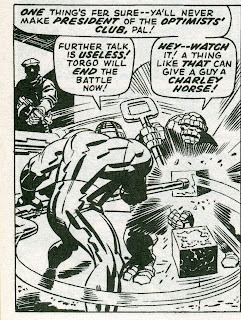 But, though Kirby had long since earned the right to have complete creative control over anything he did—I have to say I think he was mistaken to so abruptly cut off an ongoing story. The regular readers of the Losers were unhappy and they had a point. They wanted to see the story they had been reading come to a proper end. Well, Ona wasn’t completely forgotten. Kirby eventually returned to Marvel for a time and Kanigher once again became the writer. 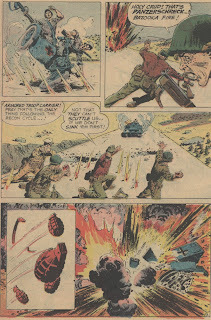 In Our Fighting Forces #168, the Losers are on a mission in Norway and they meet Ona once again. All the characters seem to have forgotten the details of their previous adventures—the Losers simply say she was presumed dead, while she explains she was ordered back to Norway to rejoin the Underground. There’s no mention of her blind boyfriend or the suspicion that she had turned traitor. Probably, Kanigher didn’t have time to go into detail and simply did the best he could in bringing some degree of closure for Ona. According to the DC Wiki, she also appears in Our Fighting Forces #173 (an issue I haven't read), but then seems to have disappeared. The poor girl has been forgotten. And that’s too bad. Women both that pretty and with the grit to eviscerate SS officers are all too rare in the world. Personally, I've never trusted clowns. William Conrad was one of radio’s finest and hardest-working character actors. Sometimes it seems as if its impossible to find an OTR episode from the late 1940s and 1950s that didn’t have Conrad in it—if only in a bit part. This episode of Escape is a tour de force for Conrad. He’s a veteran suffering from shell-shock who becomes lost and panicky during a foggy London night. His doctor has advised him to avoid any shocks, but that’s a hard thing to avoid when you stumbled across the body of a murdered woman. A great script and a brilliantly constructed plot support Conrad’s performance as it all leads up to a fantastic ending. I suspect Burroughs had tentatively planned to use Jason as the hero or co-hero in the eventual sequel as he (Jason) searched for his missing friend. 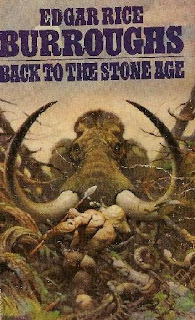 But, though Stone Age picks up right where its predecessor left off, it was seven real-life years before Burroughs got around to writing it. By that time, he had opted to center the story entirely around von Horst, leaving Jason with nothing to do but go home. 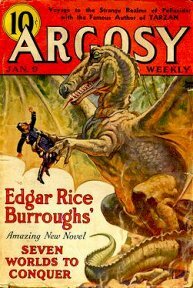 The story first appeared as a serial in Argosy Weekly in early 1937. Its original title was “Seven Worlds to Conquer,” because von Horst runs into that many tribes (or—in one case—the nest of a very large animal) before his adventures are resolved. By the way, in case you’ve forgotten—von Horst was a member of the crew of the zeppelin O-220, which had entered Pellucidar through the opening near the North Pole on a rescue mission. He had become separated from the others fairly early in the previous novel and was still unaccounted for when the main plot of that novel was resolved. Well, von Horst might have missed out on the action in Tarzan at the Earth’s Core, but he certainly wasn’t bored. The loosely structured sequel tosses him from one adventure into another as he escapes captivity in one location only to be captured by someone else. This is an ERB novel, so along the way he meets the beauteous La-Ja, who is a fellow slave during one of his frequent periods of captivity. Their relationship runs the usual course—he takes a while to realize he’s in love, while she treats him like garbage due to a cultural misunderstanding. Even when she gets to like him, she continues to treat him like garbage, because there’s a big brute of a guy named Gaz back at her tribe who wants La-Ja for his mate. 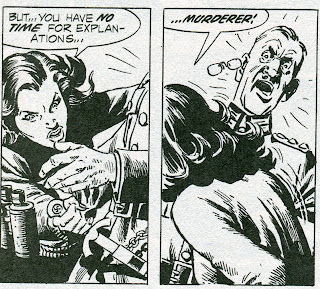 La-Ja is afraid Gaz will kill von Horst when the German insists on escorting her safely home. It’s a variation of the same sort of situation that Burroughs used in many of his other novels. You’d think it would get old, but I’m never bothered by it. Burroughs always manages to generate a fair amount of humor and even charm in his romantic shenanigans, predictable as they might be. Also, Burroughs gives von Horst (perhaps my favorite of Burroughs’ one-shot heroes) a snarky sense of humor that adds to the overall fun. 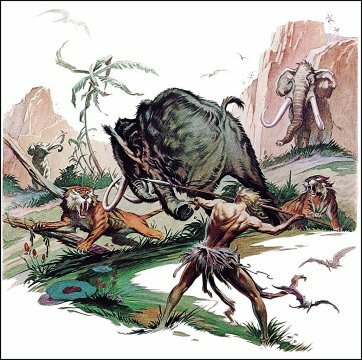 What makes this entry in the Pellucidar series notable is the cool civilizations and animals that von Horst runs into. He’s captured by a weird flying reptile/kangaroo thing that injects him with a paralyzing poison and leaves him for newly hatched babies to eat. Later, he has to organize a mass escape of slaves while simultaneously holding off the slave-holders AND fighting a stubborn slave who refuses to accept his leadership. Not long after that, he, La-Ja and a couple of other companions get captured by a race of fanged albino cannibals called the Gorbus. There’s an unusual metaphysical twist here, as the perpetually cruel and miserable Gorbus are implied to have once been humans on the surface world who had become what they are now after having committed murder. Odd theological implications aside, I’m just happy that Burroughs gives me the opportunity to link words “fanged,” “albino,” and “cannibals” together in the same sentence. How often does one get to do that? Burroughs manages to get in a nice variety of action scenes throughout the book. 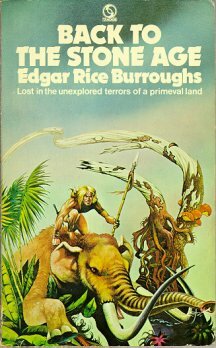 Most notable, perhaps, is an escape from the mammoth men (a tribe who have trained mammoths to be riding beasts). This involves a sequence in which von Horst and several other prisoners are tossed into a narrow cavern, then given knives and spears. Large, untrained mammoths are released from one end of the cavern, while a number of saber tooth tigers enter from the other end. The ensuing free-for-all is a lot of fun (for us readers, I mean—not so much for the participants). Along the way, Burroughs borrows a plot twist from “Androcles and the Lion” to give von Horst a large mammoth as a loyal companion. This is another element that’s completely predictable, but once again I’m not at all bothered by it. Having a mammoth as a loyal companion is simply too cool to allow for any objections. 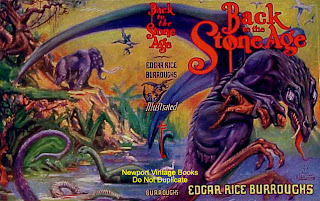 In fact, it occurs to me that visitors to Pellucidar end up with some pretty cool pets. David Innes had his pet hyenadon in the second novel in the series and now von Horst ends up with a mammoth. Why anyone would ever be satisfied with a mere cat or hamster after reading these novels is beyond me. Anyway, von Horst and La-Ja eventually make it back to her tribe, which leads to the von Horst vs. Gaz fight that poor La-Ja had been dreading. Von Horst gets a great line here just before the fight to the death begins: “You’re the man I’ve crossed a world to kill!” he snarls at Gaz. When you think about it, there’s really no sense in falling in love if it doesn’t give you a chance to use dialogue like that, is there? David Innes gets a cameo at the end, which is where we find out that Jason Gridley and the O-220 had already gone home. Von Horst doesn’t mind, though. Like David Innes, he’s found a home at the Earth’s Core. And perhaps it’s just as well—considering who was running von Horst’s home country of Germany by this time, he was much better off where he was. That brings us to Land of Terror, in which David Innes takes over as protagonist once again. This book and Savage Pellucidar will, sadly, begin a decline in the quality of the stories in this series, but the Earth’s Core will remain an interesting place to visit regardless. 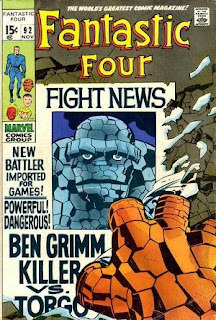 Ben is still a prisoner on the Skrull-Mobster planet, being trained to fight in the games. These games are a big deal, since mob leaders bet their territories on fighters they think will win. Ben’s not normally someone to take slavery lying down, but between the strength-sapping collar he’s forced to wear, the “hypno-glow” ray in his prison cell, and the tommy guns that double as “brain blasters,” he’s pretty much helpless. All the same, he does well in his training sessions, impressing those who watch him into thinking he might beat everyone except Torgo. Nobody beats Torgo. He also wonders why the slaves don’t band together and revolt, but Torgo points out the huge sonic disruptor that will destroy the homeworld of any slave who disobeys. This is all cool stuff. As with the previous issue, the combination of Prohibition-era imagery with science fiction gadgetry and a variety of alien monsters give the whole story a unique and completely fun vibe. Meanwhile, back on Earth, Reed is prepping the Skrull saucer ship captured way back in FF #2, intending to trail Ben all the way to the Skrull galaxy if need be. Last issue was pretty much all action. This issue is paced much slower, giving time for some characterization and introducing a sort-of villain. It’d probably be a lousy issue for a new reader to come aboard. (“Hey, all this Spider Man guy does the whole issue is make a phone call!”) But for regular readers, the story is presented smoothly and expertly. Peter sees Gwen at the coffee shop with Flash Thompson and immediately assumes he’s lost her. Gwen, though, is simply trying to find out if Flash (who has known Pete much longer than she has) knows anything about his mysterious disappearances. So Peter as girl trouble. And—since he’s Peter Parker—he’s also having money trouble. He stops by the Daily Planet to ask for an advance and—since he’s Peter Parker—walks into yet more trouble. 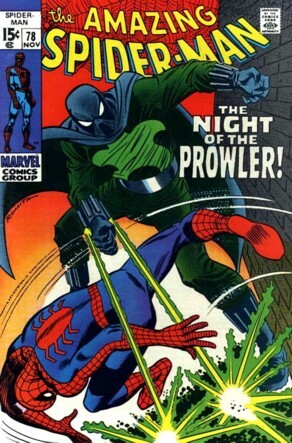 The villain he meets is the Prowler. 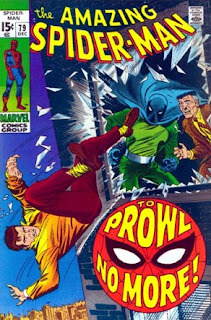 The Prowler is really Hobie Brown, a young black man with a talent for inventing things. But Hobie is stuck in a dead-end job and his racist boss won’t look at his ideas for improving safety and performance on the job. There’s a great scene that’s an important part of introducing us to Hobie. He’s washing windows on the Daily Bugle building. He’s working slowly while he’s thinking about his life in general and his boss brings him to task for this. It’s J. Jonah Jameson—of all people—who tries to cover for Hobie and who reacts with anger and disgust as the boss’s racism. I love seeing glimpses of this side of Jonah. He’s still a tightwad and a short-tempered jerk and that’s what we usually see (heck, we see that a little later on in this issue), but every once in a while one of his redeeming qualities sneaks out for a moment. Anyway, Hobie comes up with idea of using his inventions to become the Prowler, commit a robbery, then “find” the loot as Hobie and become a hero for turning it back in. It’s a dumb plan, of course, but it fits in with Hobie’s tendency to feel sorry for himself. He tries to rob the Daily Bugle building, figuring that’s the quickest way to get publicity. Peter is there and confronts him. But—since he’s Peter Parker—a problem arises. Jameson comes into the room, meaning Peter can’t let loose on the Prowler without giving away his secret identity. 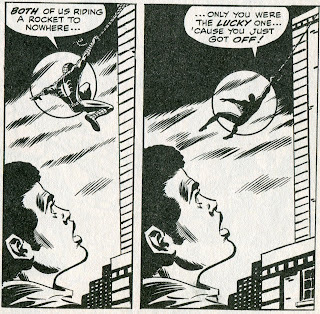 So the issue ends with Peter "falling" out a nearby window to his apparent death. The Thermal Man is rampaging through New York City. 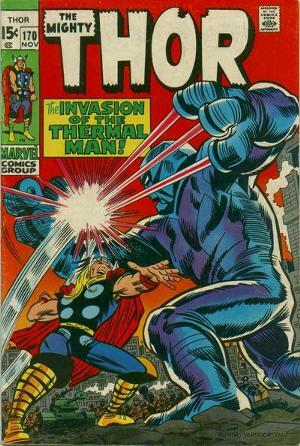 Thor joins Balder and the Warriors Three, but make no progress against the giant robot. It’s a nifty battle, including a really cool sequence in which Fandral does his swashbuckling best to avoid the robot’s blows and land a sword cut of his own—only to have his sword shatter. The Thermal Man is so dangerous that even the Red Chinese have second thoughts about it and send over a bomb designed to take it out. This apparently does knock the robot out. But while Thor reverts to Blake and treats wounded soldiers, the robot gets up again and quickly takes down the other Asgardians. Karnilla’s been watching the fight and—concerned about Balder’s safety—teleports him and the Warriors Three to her realm. Thor, in the meantime, calls in a massive tidal wave to carry the Thermal Man away from the city and into the Arctic Circle, where it will be frozen forever. So it’s another all-action issue, which is a good thing. Thor spent the previous issue pretty much just sitting on his duff listening to Galactus recount his life story. This issue most definitely gives Thor something to so. It’s nice to see our favorite Thunder God back in action. That’s if for November. Next week, we’ll jump back over to the DC Universe and jump back in time to World War II with a look at the Losers and an examination of a long-forgotten supporting character from that book. 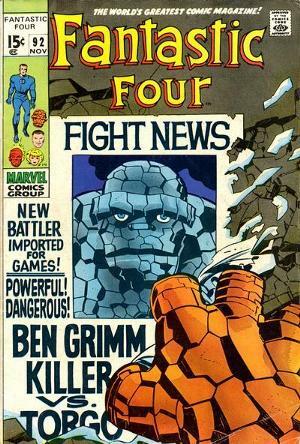 Then, in December 1969, the FF play at being intergalactic Untouchables; Peter Parker gets murdered; and Thor goes up against an old enemy. 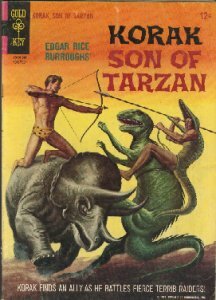 Tarzan's son Korak only starred in one of the original books and had just as few brief cameos after that before pretty much disappearing. His dad, it turned out, was more than awesome enough to carry the series on his own. 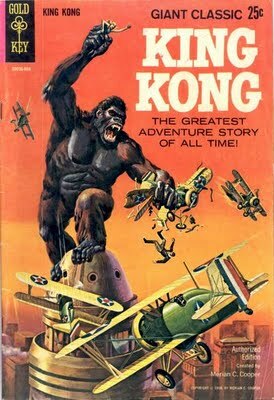 But Gold Key Comics gave the junior Lord of the Jungle a chance to shine. This is my second-favorite episode of Escape and (depending on my mood) my second-favorite OTR episode of all-time. Vincent Price does a perfect job of narrating a tale about men treking through the Amazon jungle and discovering that all the dangers from malaria, vampire bats, piranha, electric eels and pythons don't hold a candle to the danger of being double-crossed by your "friends." Paul Frees describes this story as "seething" in the introduction. That's the perfect word to describe this edge-of-your-seat tale. I was checking the discount DVD bin at Big Lots, knowing that it’s quite possible to run across an occasional treasure there. And, bingo, I find one. It’s a two-disc set featuring John Wayne in a couple of 1940s Republic Westerns. It’s priced at only five bucks. Now it’s possible that I might have simply made a mental note of the titles and then later checked to see if they were available through Netflix or the public library. As much as I love old B-movies, I don’t always feel the urge to own particular ones. But then I notice something that clinched the deal for me. 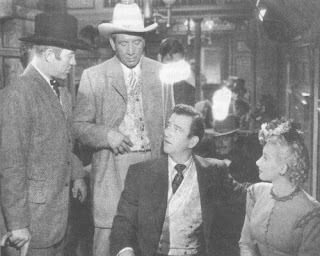 One of the movies—Dakota (1945)—had character actors Ward Bond and Mike Mazurki teaming up as the bad guys. A Bond/Mazurki team-up? I now definitely felt the urge to own this particular movie. Bond co-starred with John Wayne in several zillion films over the years—often in John Ford-directed vehicles. Mazurki made a career of playing mostly brutal thugs, something he did effectively in both serious dramas and comedies. Bond was the more versatile actor of the two, but both men always got the job done in any films in which they appeared. Bond is particularly fun to watch this time around. He didn’t often play out-and-out villains, but it’s not at all surprising that he does so quite effectively here. By the way, if you watch this film, don’t forget that there is an honored tradition to point at the screen and shout out Mike Mazurki’s name when he first appears. Also, the movie has a riverboat in it. Any movie filmed in black-and-white that significantly features a riverboat is required viewing. Bond and Mazurki are running a scam on the local farmers in the Dakota Territory, using a carefully planned combination of con artistry and violence to gain control of the land in anticipation of a railroad coming through. When John Wayne’s character loses $20,000 to them, he becomes a de facto champion of the farmers. The film is notable not just for the cast, but also for the amount of humor in it. 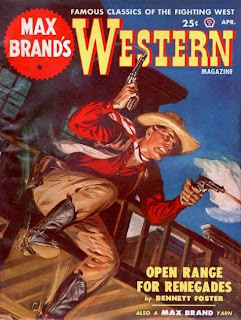 In fact, there ‘s a lot more humor, presented more effectively, that you usual find in Westerns from this era. The script allows the actors to have fun with the story. Most notable here is Vera Ralson as Wayne’s newlywed wife, a strong-willed woman who makes a pretense at being submissive, but then does whatever she wants anyways. 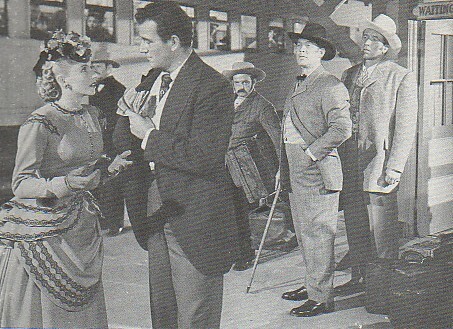 It is her, in fact, who is responsible for Wayne’s character being in the Dakotas. When they were leaving Chicago (one jump ahead of her disapproving father), he told her to buy train tickets to California. She told him she would, then bought tickets to Fargo. She had decided he could make his fortune there. But within this context, the relationship between the two remains sweet and there’s no problem believing that the two of them are truly in love. This provides a strong and believable emotional background to the plot. Walter Brennan adds more humor in his role as a riverboat captain who yells at his ship, mumbles to himself a lot and doesn’t always seem like he’s quite all there. It’s a nicely balanced story—the humor is used to establish the characters without ever conflicting, either thematically or in terms of pacing, with the main plot. Everything mixes together nicely until the climax, which includes an attempted lynching, a free-for-all gun fight and a raging prairie fire. By the way, other than the two being on my short list of favorite character actors, Bond and Mazurki working together is fun in another way. A year or so before Dakota was made, both had played the character of Moose Malloy in different film versions of Raymond Chandlere’s Farewell, My Lovely. 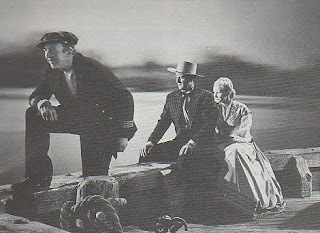 Ward Bond, Mike Mazurki and a riverboat. How can one NOT watch this movie? I know that Mort Weisinger would often supply basic story ideas or modify what the writers brought to him, but I have no idea how much of the Supergirl story in Action Comics #252 (May 1959) comes from him and how much came from writer Otto Binder. Both men had a keen grasp of comic book logic—the ability to think out the implications of the fantastic elements that populate Superman’s universe and use those implications for new story ideas and plot twists. This time, an important factor of this story is that the explosion that destroyed Krypton turns all the surviving fragments (large and small) into deadly green kryptonite. That’s important, because here we learn that a big chunk of Krypton broke away from the planet when it exploded, carrying Argo City and a large bubble of air with it. Don’t think about the science behind all this. That way lies madness. Argo City’s leading scientist is Zor-el, brother of Superman’s dad Jor-el. He makes sure the city’s food machine is working—so they have food and air. They can survive, right? Well, maybe not. Because the planet fragment they are sitting on turns into green kryptonite! Zor-el deduces the problem and they cover the ground of the city with lead sheeting. Zor gets married, has a daughter named Kara and raises her into her mid-teens before a meteor storm punches holes in the lead shield. Suddenly, all Argo City is doomed to slow death by Kryptonite poisoning. Apparently, no one in Argo City knows how to use a soldering iron. Zor-el quickly throws together a space ship big enough to save his daughter. Using a space telescope, they locate Earth, decipher the language and learn about Superman. Kara’s mom makes her a version of the Superman costume and it’s off to Earth in the nick of time. Of course, years later, it turns out Zor-el and his wife Alura zapped themselves into a Phantom Zone-like dimension in the nick of time. They eventually get out and settle in the bottle city of Kandor. 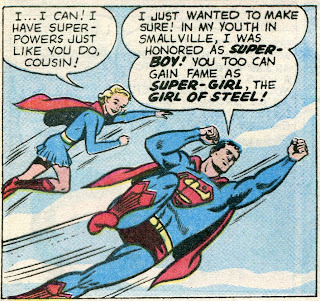 But for now, Supergirl thinks she’s an orphan. 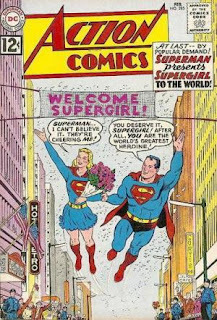 She arrives on Earth and meets Superman, who immediately sticks her in an orphanage, where she uses the name Linda Lee to preserve her secret identity. She’ll soon get a family of her own, though, when she’s adopted by Fred and Edna Danvers. 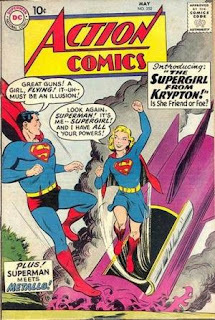 Superman will keep her existence secret from the world for a few years, before revealing her to an enthralled public in Action Comics #285 (February 1962). But Supergirl isn’t the only survivor of Krypton that enters into Superman’s life during the Weisinger era. Next time we visit Metropolis, we’ll meet another lesser-known survivor from Krypton. I don't know why Gold Key decided to adapt the movie into a comic book 35 years late, but I'm glad they did. I won't waste a day when I do a regular post to shamelessly self-promote myself, but--by golly--I'll write a special weekend post to do so! A short e-pamphlet that examines seven films starring Humphrey Bogart made just prior to or during World War II. Themes of self-sacrifice, service to others and confronting evil run through all these films--themes that are still viable and important today. A guide to old-time films and cartoons designed to help parents ensure that TV time for their kids is an entertaining experience that also has respect for the innocence of childhood. This isn't just a classic film list, but also includes lesser-known B-movies that are still worthwhile in terms of good storytelling. The movies and cartoons on this list are first and foremost well-told stories. It is hoped that they can also teach children a little bit about our cultural history and maybe toss in an occasional lesson about honor, courage, faith and responsibility. 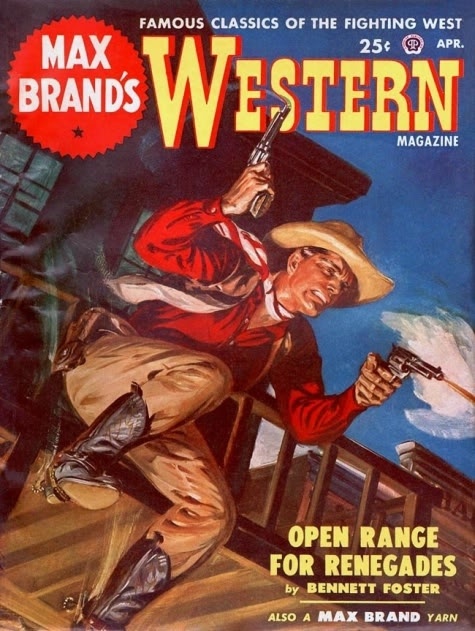 A review and detailed episode guide of the Western series that played on CBS radio in 1956. A strong, well-written show with great characters, it was a short-lived but worthwhile edition to the Western genre. Raymond Burr starred as Captain Lee Quince, the tough professional who led a cavalry troop stationed at the titular fort during the 1870s. Mr. Moto was a 1951 spy/mystery series based on the character created by novelist John Marquand. A spy for the Imperial Japanese government in the original novels, he became a Japanese-American agent for the United States in the radio series. The very polite, very intelligent and (when necessary) very ruthless Mr. Moto foiled a variety of Communist plots over the course of 23 half-hour episodes. A brief history, review and episode guide for the 1950 old-time-radio comedy "Granby's Green Acres." A summer replacement series that had a very brief run, it was later used as the model for the successful 1960s television series "Green Acres." All my e-books are only .99 cents. Remember that you can download the Kindle app to your computer or mobile device for free. This is the rule book for playing a game that requires you provide a pencil and paper for each player. You would also need to have some ten-sided dice and six-sided dice handy. In this game, each player commands a space ship taking part in a pirate raid on Civilized Space. There are a succession of missions to undertake. With each mission, the players must individually decide how many attack shuttles to risk, how many missiles to launch, and whether to use Risky Tactics (increasing the risk of damage to your ship, but earning you more Glory Points.). The more resources a player uses on a mission, the more Glory Points can be earned--but that leaves less resources available for later missions. Players whose ships suffer too much Hull Damage or Crew Loses are knocked ou of the game.Those who survive until the end of the game (which includes surviving a final battle with the intrepid Earth captain Isaac Templeton of the battleship Saturn's Glory) add up their total Glory Points. The player with the most points wins. This is a very simple game that can usually be played in less than half-an-hour, If you are in the mood to lead a crew of bloodthirsty alien pirates on a quest for loot and glory, then you'll enjoy SPACE PIRATES. "most entertaining...very perceptive...There’s a lot here, and it’s organized very well...a fine study"--Classic Images; "painstakingly, DeForest carries his readers down memory lane in a nostalgic tribute to a trio of abandoned story models after the inception of modern technology...his research appears authentic and sweeping and his writing style compelling...fascinating"--Radio Recall; "methods used to perform the task of storytelling are examined in detail...an interesting and highly informative read...recommend it highly"--Illustrated Press; "delightful...astounding compendium...impressive...captivating"--Science Fiction Studies; "interesting and rewarding...lively tone...an interesting and insightful endeavor...anyone who loves pulps, comics, and especially radio--and anyone who appreciates the intrinsic value, both aesthetically and morally, in each medium--will treasure this work"--SPERDVAC Radiogram; "interesting"--Critical Mass. During the first half of the 20th century, radio's hunger for captivating characters and stories could not be sated. Three national networks and dozens of independent stations had to fill a vast expanse of air time with comedy, adventure, mystery, drama and music, night after night. It's no surprise that producers and writers looked to outside sources, drawing some of old-time radio's most beloved characters (Sherlock Holmes, Tarzan, Hopalong Cassidy, Buck Rogers) directly from books. This work examines individual characters that jumped from prose to radio and a number of programs that specialized in dramatizing literature. It covers mystery and detective shows, adventure stories, westerns, and science fiction, and anthology shows that adapted novels by such greats as Twain, Steinbeck and Dickens. The text explores how the writers and producers approached the source material--what they changed, what they kept and what they left out. I know my books are little expensive, but an alternative is recommending to your local library that they purchase copies of it. If enough of you buy my stuff, I'll be able to purchase a huge mansion on a hill, then spend my time looking disdainfully down on all you "little people." And, really--who wouldn't want that to happen? I created a very simple game some months to be played with pencil, paper and a few dice. I and a few friends have enjoyed playing it. Originally, it was a game about Klingons raiding into Federation space, but I decided to make it available for the Kindle. So I've changed it into a more generic Space Pirate game. Basically, each player is Captain of a pirate spaceship, deciding how many of his resources to use up on each successive mission. When the game ends, the pirate who has earned the most loot (calculated as Glory Points in the game) wins and becomes Pirate King. Nick takes on the apparently banal task of finding a stolen cat, but that case snowballs into a dangerous hostage situation. Despite at one point depending on a coincidence rather than Nick’s detective skill to move the plot along, this episode is unusual and fun. Besides, Nick Carter was a consistently well-written show, so they could get away with tossing in an occasional coincidence.